I lived many years in Paradise, CA. My life truly began when I made Paradise my home. I was only 21 years old, having just received my undergraduate degree. I struggled with autoimmune disease and emotional challenges. I felt hopeless and confused, and was clueless when I contemplated the question, "Who am I?" The community of Paradise helped me find these answers and I am who I am because of that community. Current headlines are focusing on the wildfires ravaging this community, but what many don't know is that in 2003–2004, this community faced another crisis. Following the death of four young men between the ages of 17 and 23, two from drug overdoses, and two from suicide, this small community formed a Renewing our Vision for Youth team with the goal of maximizing the resiliency of youth and creating a community that wrapped around them. The community also implemented the principles of the 40 developmental assets from the Search Institute. These assets have been identified as strengths youths need to succeed. Grassroots community organizing took place as individuals wanted to find ways to increase community assets. One of many program models, including Paradise Dancers, evolved. A proactive community member converted the back of his small home into a dance studio. Youths felt safe and valued. They were invited to come after school and socialize, learn to ballroom dance, and lead events at no cost. To date, hundreds of youths have graced the dance floor, reducing involvement in high-risk alternatives. This community worked tirelessly implementing programs that modeled The Search Institute's developmental assets. The outcome was that assets were cultivated within all of us, regardless of age. I was privileged to serve and learn from these programs. Now is the time to remember the strengths that exist in this community and to recall the assets that make it shine. The Paradise community embodies the essence of social work—community building, service to others, empowerment, advocacy, social justice, and hope. These social work values permeate all sectors of Paradise, such as the school district, law enforcement, and local businesses. It is within this small community that I came to know and understand social work. I was inspired and remained a resident of this community while completing my graduate degree in social work and completed a case study for my thesis project titled, "Empowering Youth Voice in the Paradise/Ridge Community (2006)." From Paradise, I learned how to help people, how to love myself, and how to be a part of a community. Most importantly, I learned how to trust and depend on other humans who can love and be there for you. These were life-changing gifts. I am no longer a physical resident of Paradise, but I am a lifetime resident in my heart. It is within this community that my dearest friends and social worker family have lost their homes and in some cases their clients and loved ones. As I received notice that my peers were in what they described as a "horror movie," I was in disbelief. What can I do? This was the first time the social workers from whom I had drawn strength, the heart and soul of this community, were no longer able to help. Fear consumed me as I imagined what this community would be like without the "glue" of these social workers tirelessly giving behind the scenes. What happens when community social workers are immobilized from helping because they are in the thick of crisis? I scrambled like many others to contribute what I thought they needed. Then I saw a post from a social worker who lives in this community. She eloquently described what she believed her community needed and what she needed as an individual and as a member. I remembered the importance of listening to what community members say they need and not overwhelm them with my own ideas for them, in my own efforts to be heroic. I remembered this community is empowerment oriented, giving a voice to those directly impacted by any tragedy. It was no surprise that, once again, a Paradise community member would give me the guidance I needed to support my social worker peers devastated by the fire. I remembered the years of research I conducted as this community taught me what it means to withstand crisis and come out stronger than ever. I also remembered what my social worker mentors from Paradise taught me through the years. • Don't underestimate the value of helping one person at a time. Focus on one person at a time so they feel heard, loved, and valued. A person-centered act of kindness such as replacing a pair of dance shoes, a cup from a treasured Disney collection, or a print of a family picture rekindles the assets and resiliency that remain inside of us. We all want to feel uniquely valued and remembered, especially now, and this help restores dignity and self-worth, which may be diminished now. • Listen to individual needs and/or wants. Ask what each person needs or wants. Don't assume that because individuals are in crisis that they need to be "told" what they need or what to do. If your colleague or friend says they want chocolate, take them chocolate. This may seem trivial, but feeling valued and heard is essential to getting one's life back. Moment-to-moment support also heals. • Listen to social workers who are directly serving fire victims. If the community is saying "no more donations," listen. There are many social workers volunteering at donation sites and shelters. They are sorting, distributing, comforting, and serving on the front lines. These social workers are excellent resources to get an accurate account of needs that are now filled and gaps that currently exist. • Remember the Paradise community members are already experts. These community members and social workers are already experts in how to rebuild their community. Imposing plans without asking and not including them in the process goes against what this community values. They hold the answers to "how." We need to prepare ourselves to listen. • Organize and integrate fragmented resources for easier access. While internet access and social networking are valuable in a crisis, they can also be overwhelming. Hundreds of posts and articles about resources are flooding social media. Resources can be fragmented and accessing them can seem daunting. Our job as social workers is to sort through these resources and make them accessible for those in need. Let's do our research and pull together these resources and present them to those in need in a manner that is user friendly. Information overload is a real thing. • Coordinate therapy services for a social worker peer. Remember, social workers need therapy too. 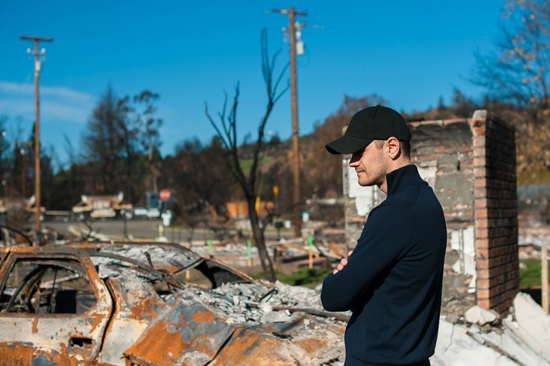 Many clinicians trained in EMDR and other nonprofit agencies are offering free and low-cost therapy for those impacted by the Camp Fire. Coordinating in-home therapy to reduce trauma is one act of kindness that can go a long way helping our social workers. • Instill hope. It is time for us to remember how to instill hope in our peers. Remind them of what you know about them, what strengths they have, and your belief that they will have a future. If they don't have hope, hold this hope for them. • Remember, even social workers are vulnerable and need time to grieve. It is easy to forget that social workers need help because they often embody much strength. Seeing my peers struggle has reminded me that none of us are invincible. Just because we are trained in crisis management does not mean we can manage our own crises. Everyone needs help—especially during these times. Normalizing this with our peers is essential. • Censor ourselves and our own use of social media. There is an abundance of images and stories capturing the terror of the Camp Fire. We need to monitor our own actions and remember that an ongoing dose of these images and stories can be retraumatizing. Be careful how many posts you share or react to on social media. Remember your peers are also seeing these images repeatedly. Ask yourself, "If I had lost a loved one or survived the fire, what images and stories would I want to hear/see over and over again?" In the present moment, I have grounded myself and have regained confidence in knowing what Paradise taught me and that is to listen. Listen to people of the community of all ages because despite the crisis, this community has strength and wisdom that is its greatest asset. We want to fix everything quickly and ease the pain. I want to do the same. However, when we don't know what to do, the most important thing we can do is listen. Then we can remind and thank these amazing Paradise social workers and community members for their strength and how they have modeled for the rest of the country "how" to face tragedy and build community. — Casey Hersch, MSW, LCSW, is a former resident of Paradise, a licensed clinical social worker, and author. Search Institute (n.d.). The Developmental Assets Framework. Retrieved November 26, 2018 from https://www.search-institute.org/our-research/development-assets/developmental-assets-framework/.